Did Kawasaki build the new ZX-14 for those who think that maybe Suzuki’s Busa is a little slow in the performance department? Lets face it, who is really going to use 197 Horse Power? The Mustang GT carries close to 300 HP and the Corvette claims 400 HP. We are Americans and different strokes for different folks Right? To look at me most people would never think I’d even know how to ride a motorcycle, yet alone a motorcycle with 197 HP. I’ve been told that I’m unforgiving. About me, I weigh 155 lbs. and stand 5 foot 4 inches tall. Hey I can’t even flat foot when I stop. Do I run the ¼ mile in under 9 seconds? No! Have I taken the new ZX-14 to 186 mph? Um No! Hell, I’ve never had a speeding ticket (knock on wood). So how am so unforgiving? Well I ride excessively, 21 hours on maybe 5 hour break (I call it sleep) back on for another 18-20 hours then I might give myself 6 hours off. Note the center Stand on a bike that’s 3 weeks old, maintenance has to be done on the Road. From time to time I will refer to my Honda VFR. The VFR has been in my stable for the past 4 years has over 83,000 miles on it. Changing of the guard sort of speak. 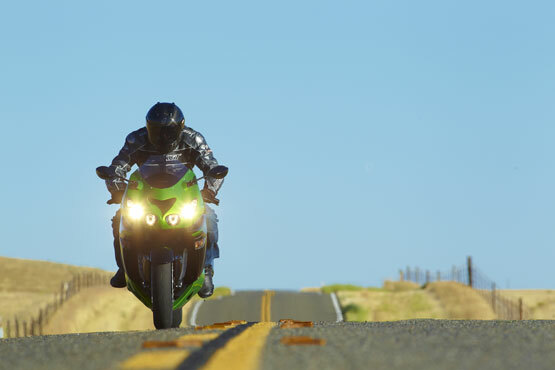 Upon delivery of the ZX-14 I could not wait to get it on the open road. The VFR is a great touring machine, the ZX-14 is better. I had 200 miles under my belt when it occurred to me my hand was not falling a sleep. No kidding this may be the smoothest engine ever built, clearly the smoothest I’ve ever driven. There are a couple of points I’d like to note. The automatic choke works differently from any other bike I’ve owned. Seems as though the moment you make the bike vertical the rpm's dive to normal 1,200. I suspect that has something to do with the fact that your riding 170-190 HP on high idle. Coming from the VFR riding the ZX-14 is a real hoot, chirping the rear tire from 3rd to 4th and 4th.to 5th only tells me this is a motorcycle that demands respect. Breaking-in the bike I’d drop down to 4th gear and ride for a mile or so then 5th then 6th. While in 4th gear I had a car pull into my lane. I twisted the throttle as I would have on the VFR, and I’ll be dammed if the back end didn’t break loose, I slowly cut back on the throttle all was good and I was pretty far ahead of the trouble. Seems like one of Kawasaki’s goal was to make this bike civil below 5000 rpm and as nasty as one wants to be above 5000 rpm. This is very helpful when riding in Rain, I write from a Touring perspective. The Handling: is incredible for a hyper-bike, the VFR only wishes it handled this well. It’s interesting to say that sometimes in motorcycle touring people don’t want a bike that handles this well. You see as an ST rider adds miles sometimes we ride a little sloppy. The ZX-14 is very forgiving but this is a very important to acknowledge ST rider has to stay on top of their game, well maybe more than most would expect. Although the ZX-14 weights about 4 lbs more than the VFR they handle very differently. The ZX-14 is crisp and accurate. The VFR feels lighter but not as accurate, I suspect the engine design has more to do with the feel than weight. The ZX-14 actually felt very confident even in some of the harder corners of Deals Gap (tail of the Dragon). It’s also fun to ride a bike with this much HP in the Mountains, it did not take me very long to adjust to mountain riding on a motorcycle with this kind of HP suspension is very confidence inspiring. The Transmission: is smooth and very sure. After owning the ZX-11 and test riding the ZZR-1200, I can tell you these tyrannies have nothing in common with the ZX-14. Riding in a town with more cops than people at 5AM, I actually do 35 MPH and the ZX-14 has the sweetest shift point at 3200 rpm right up thru 6th gear which happens to be 50 MPH. It’s not as smooth from 4-6000 rpm but the sweet spot again comes back above 6000 rpm. The Look: Well some may say this motorcycles nose will take some getting used to but I like it, I still think the ZX-11 is one of the best looking motorcycles. As a owner of a ZX-11 and VFR I do miss the running lamps but the ZX-14 does have an extra set of lamps in the top corner of the high beamers. The VFR which has pretty powerful high-beams but the ZX-14’s are superior. Being a practical guy, I like things to work and for the most part the ZX-14 works. Note the picture showing the side of bike, the so called Foreman Grill. This design has a purpose, keeping heat away from the rider. When not moving this bike does a pretty good job pushing the heat at a 90 degree angle away from the rider. Some heat does make it around to the rider between 30-50 MPH. Above 60 mph heat is very manageable at any temperature. Once the ambient temperature goes above 85 degrees F this puppy can get hot especially below 50 mph. Better than my ZX-11, that could cook you pretty good even in the heart of Winter. Brakes: Front brakes are excellent, both in feel and ability. However, the rear brakes are slightly better than a block of wood. It’s the biggest negative of the motorcycle. I’ve almost stood on the rear brake and did slow the bike but I was not impressed. The Trip: I’m going to do a lap of the eastern US. Starting where I live Orlando, Florida, Deals Gap, NC, Land Between the Lakes, Ky., St. Louis, Mo., Virginia Beach, Va. and back home again all in 3-4 days. The objective is to see how well the ZX-14 holds up to mile after mile of riding. Objective is to see how well the ZX-14 holds up to 2500-3000 miles in 3.5 days. I have some extra time built into the schedule so if I must do a 100+ mile detour well that’s fine with me too. I’m starting the trip with 2,275 on the odometer and I don’t think that’s too bad considering it’s 3 weeks old. Friday May 26 I woke up at 2 AM and did my normal weather check and I was not happy at what I was looking at, rain almost 100% in Tn. and Ky and it was heavy. I sat for almost an hour looking at the computer trying to figure a way around it. Riding around the rain I would lose one of my destinations and I really wanted to stick to the planned route. I figured well lets get up to Lake City, Florida and hopefully; the route can be better planned from there. Being the nerd that I am, yes my phone has radar capability. Once in Lake City I checked the radar and I'll be dammed if the rain was gone. I actually stopped in a Waffle House some 12 miles west of I-75 believing that it would be best to come up thru Mississippi. I then looked up the forecast for Nashville and St. Louis and it was like 30% chance of rain today 10% Saturday. OK so this put Deals Gap back into my vacation plans. I would have to go through Atlanta, not my favorite route but it was the shortest. So up through Atlanta I go and all things considered it was not too bad, one accident kept me in traffic maybe 30 Min's, then onward to I-985 then US 23 until I hit hwy 28 in Franklin, NC. Once I made it through Atlanta, traffic riding sure got easy and the mountains were a beautiful site. Just before arriving in Franklin the sky's opened up. A guy on the ZX-14 website says that after he rode in the rain that his bike had all kinds of problems. I kept thinking of that e-mail as I was getting drenched. Thankfully, no problems and the bike rode just as well in rain as if it were sunny. The rain lasted about 10 miles and riding over 3000 miles this was the only rain I hit the entire trip. I really think hwy 28 between Franklin and Lauada is every bit as challenging as the Gap, maybe more because the roads are in rough shape and are not marked as well as Deal’s Gap. All was good because it gave this Florida-Boy an opportunity to get used to the roads with out the pressure of other riders on my tail. Let me make a note to how well the ZX-14 handled, think of it as a slightly better handling VFR with a motor that's on steroids. Yep it's that good. Small glitches like a slight throttle delay above 1200 feet that did not change as I climbed as high as 4000 ft. The VFR did a little better, I did not feel a delay until 2-3000 feet but it did get worse the higher up in elevation. After the gap I rode up I-40 to 70 miles east of Nashville. Weather started to become an issue and I was feeling pretty beat, so I packed it in for the night. Day one I traveled about 850 miles and I could not have been happier with the ZX-14. Day 2: I started out heading towards Nashville, the weather look a little rough but the direction I was going everything seemed clear. Nashville is a beautiful city, I was riding through at about 7 am and it was pretty dead. Heading towards The Land Between the Lakes there was this huge storm very near the lake. There was some wet pavement but I never hit a drop of rain. It was beautiful, the storm was to the east of me and the cloud covered the sun so the temps stayed in the 70's almost all the way to I-24 near Paducah. The Land between the Lake is a very beautiful area, roads were fun but having ridden Deals Gap the day before the roads did not seem as exciting. I rode a couple scenic routes and must say it was at this point I started to really enjoy "The Ride". You see the east coast the traffic really flows and the motorcyclist has to stay on top of their game at all times. In Kentucky. things slow a bit, one can really relax when riding. St. Louis is my next stop, and the weather became pretty hot, I'd say it was in the 90's before 11 am and this makes for a few more quick stops, dehydration can be a real problem if your not careful. I made it a point to stop every 50-75 miles to stretch my legs and take a drink. As I was coming into East St. Louis I noticed how nice this city has become. 5 years before I was there and it looked better than I pictured it (from it's reputation) but it looks even better now; Casinos are good thing. At about mile marker 9 on I-64 you see the Arch for the first time and it does seem bigger than life. Maybe it's just my first impression but man what a beautiful sight, also the fact that I'm almost 1/2 way home. My Odometer said 3550 that meant I traveled almost 1300 miles, the time was 2:30 PM CDT. At the Arch there was an hour wait just to get into the mall. What to do? I've been in the Arch before and chances are I would not make it out until after 5 PM so I figured I'd make a couple phone calls. I called the wife and a childhood friend that I had not seen in 20 years. She said that she would be home on Sunday if I wanted to stop over for a little while. Thinking to my self "Cool" she just lives in Virginia Beach, Va. or 1000 miles east of where I am. You know on the other end of I-64. I jumped on the bike with the song; "East bound and Down" rolling through my head, just seemed appropriate; Right? figured it would be best to follow an 18 wheeler. Well I happened to find Jeff Gordon's truck driver or something no kidding we flew to Charleston in record time and although I don’t like traveling that fast, I figured the alternative was worse so just kept up with him/her. I can't say it bothered me, in fact the truck got off on an exit about 10 miles before Charleston and I was a little disappointed, I was having fun and making good time. 3 hotels later I did find a room and Saturday was history with almost another 900 miles under my belt..
Sunday Morning, 6 AM one of my rules is to ride late in the morning when heading east, but in the mountains, this rule can be bent. Plus the fog kept the sun at a minimum. Mountain traveling is really different, (remember Florida-boy) and looking around sometimes hypnotized me, especially when the fog painted the scenery with beauty, I could have never imagined before this morning. Further it is pretty neat how fog only goes so high then it's clear. Sometimes motorcycling is just like flying. It was this morning. I reached Richmond, Va. about 11 am and I realized that I would actually keep my schedule promised. I also notice that people are not driving as pleasantly as the previous 1000 miles, I guess I'm "Back East". Of coarse there are things I overlooked like Virginia Beach is a vacation resort and it's a holiday weekend. I took me 3 hours to get to Virginia Beach from Richmond and it was plenty hot. As I approached the bridges I could feel the temperature start to drop. It was at least 94 degrees just outside Richmond and by the time I reached Norfolk it was maybe 78 degrees, a pleasant surprise. I made it to Virginia Beach a little before 3:30 pm or about 950 miles in 23 hours. I left Virginia Beach at 5 pm and traveled hwy 58 to I-95. This had to be to most difficult part of my trip. There were at least 4 set-ups and 6 pull-over. Riding 55 mph was a requirement and on the ZX one has to be disciplined, I did OK but it was very difficult. Once On 95 I figured I'd ride to 8 PM then stop, after the full schedule for the last 2 days I figured I needed a little relax time so I stopped eat a good meal watch a little TV and go to bed before 10 PM. Monday Morning I woke up at 2:30 am. Why so early? Well the wife says that the storms Florida has been having were pretty bad so I wanted to make it home just after noon. I was about 100 miles north of South of the Border so I figured that would be a good place to get a cup of coffee and breakfast. Hey the signs say opened 24 hours so imagine my surprise when I got there and the doors were locked. Yep locked so I took a photo of the ZX-14 with all the pretty lights and off I rode for another 100 miles. Another pleasant surprise was the MPG. When I first got the bike the ZX-14 averaged about 38 MPG. By the end of the trip I had several 45-48 MPG tanks of fuel. This is important because I like going over 200 miles before the "LOW FUEL" takes over my instruments. BTW I figured out that if you hold the mode button down a little red light comes on and I only lose the "Range" on the instruments. The final part of my journey was very smooth. Oh there were quite a few bear traps on I-95 in Georgia, (go figure) but it's all-good, in most cases I could run 80-85 mph or 73-78 GPS mph. I arrived home a little before 1 PM missing the rain completely. The completed trip added 3052 miles, to the 2,275 I started with totaling the ZX at 5,327 miles on my still not 4 week old bike. Next Trip: Honda Homecoming till then. Enjoyed the story. Still riding the zx?